Richard Gere is in Korea to support an exhibition of his photos in Seoul raising money for charities involved with the Tibetan human rights campaign. The exhibition – titled Pilgrim – features around 60 images the actor took in Tibet and around Asia, as well as images taken by photographers interested in the cause. The collection has already toured 20 cities in 11 countries, and is in Korea until July 24. “A lot of these photographs I didn’t show anyone because it’s such a private experience for me,” Gere told press during his six day visit to Korea. "I had no interest really in sharing them. [Taking photos] is very similar to making a movie; you’re somehow compressing lives into frame. While in Korea, Gere will also take part in a temple stay program at Tongdo Temple in Yangsan, South Gyeongsang Province before flying home on Saturday. 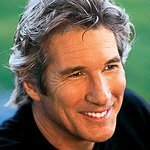 Gere has also released a book of his photos, featuring an introduction by the Dalai Lama, which raises money for the Gere Foundation. A devoted Buddhist, Gere has advocated Tibetan independence since 1978, and is a friend and student of His Holiness the Dalai Lama. He has made numerous trips through India, Nepal, Tibet, Mongolia, and China. In 1987, Gere co-founded Tibet House, and is now Board Chairman for the International Campaign for Tibet. He has testified on Tibet’s behalf before the Senate Foreign Relations Committee, the Congressional Human Rights Caucus, the European Parliament, and the House International Operations and Human Rights Subcommittee in an attempt to free the nation from China’s grip. His own charitable organization, the Gere Foundation, was set up to award grants to humanitarian foundations, especially in relation to Tibet. Gere also established Healing the Divide, an organization dedicated to improving care for HIV/AIDS patients, and in 2004 instigated the Heroes Project, which addresses the spread of AIDS in India. He is a spokesman for Meals On Wheels, and earlier in 2007 appeared in the charity’s first ever advertising campaign, along with his father who has been a volunteer for 17 years. He is also a longtime supporter of the American Foundation for AIDS Research, Amnesty International, Human Rights Watch, and the Elizabeth Glaser Pediatric AIDS Foundation. To find out more about the Pilgrim exhibition in Seoul, click here.